The internet is abuzz this evening regarding the possible discovery of wide-spread "water" or hydroxyl molecules of the surface of Earth's moon, a discovery made by spectrometers on three different spacecraft: M3 on Chandrayaan 1, VIMS on Cassini, and Deep Impact. The papers, if I understand correctly, will be published later today in this week's issue of the journal Science and I have not had a chance to look at them. There will also be a press conference later today at 2pm EDT (11am MST) discussing these results. Why do I bring these results up here on this blog? Well, according the few reports I have been able to find online, like this one here from Universe Today, from Bad Astronomy, and from NASA Watch, this discovery was made by finding a weak absorption band near 3 microns, associated with water and the hydroxyl ion (OH-), concentrated mostly near the moon's high latitude. The absorption band found on the Moon is very weak, suggesting a very low concentration of water or OH- in the moon's soil. The M3 instrument team suggests a concentration of as much as 770 ppm has been observed on the sunlit side of the Moon, according to the NASA Watch posting. While the discovery isn't quite Moon-shattering, previously water ice (or hydrogen anyway) had only been observed within cold-traps in permanently-shadowed craters near the poles. A similar absorption band was found on Io using ground-based spectroscopy (Salama et al. 1990) and Galileo NIMS (Carlson et al. 1997 and Cataldo 1999) observations. In these measurements, a weak absorption band in Io's near-infrared spectrum at 3.15 microns was observed to be ubiquitous across its surface with a concentration of 4 ppm according to Carlson et al. 1997 and 1000 ppm according to Salama et al. 1990, on the order with what has been observed on the Moon. This absorption band is associated with the O-H stretch transition. Such an atomic bond between an oxygen and hydrogen atom would be found in water, hydrated minerals, or the hydroxyl ion (OH-). Small concentrations of this band have also been observed. An absorption band near 3 microns, attributed to water ice crystals or hydrates mixed with sulfur dioxide frosts, was seen to the north and west of Gish Bar Patera by the Galileo NIMS instrument during the October 2001 I32 encounter (Douté et al. 2004). The low spectral resolution of NIMS at the time (12 spectral measurements spread out between 1 and 5 microns) makes this result a bit tenuous, but if true would indicate that concentrations of possible water ice on top of the low background levels exist on the surface of Io. So where does the "water" come from on these two, supposedly dry worlds? For the Moon, two possible mechanisms are likely. The first would be recent cometary impacts, which would bring their water to the Moon's surface near the site of these impacts. Concentrations within the ejecta blankets of several small craters on the moon provide further evidence for this hypothesis, but the pattern of the hydroxyl absorption within the ejecta seems to be more consistent with material from the target body rather than material from the impactor. The widespread distribution of water or hydroxyl ions across the moon's sunlit surface suggests another explanation. In this scenario, charged particles, in the form of hydrogen ions and transported from the Sun by the solar wind, impact the Moon's unprotected surface (remember that the Moon is outside Earth's magnetic field most of the time). 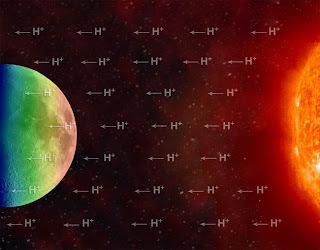 These hydrogen ions split oxygen atoms from silicate molecules in the Moon's soil, and combine with newly freed oxygen ions to form hydroxyl ions or water. As the day progresses and the Moon's surface heats up, these new molecules themselves split up, freeing the hydrogen to space and returning the oxygen to the soil. The process of water formation from the combination of hydrogen from the solar wind and oxygen in the lunar soil kicks back up the surface starts to cool down in the late afternoon and evening. Alternatively, the water molecules may become excited and be transported to Moon's polar regions, where they are deposited within those aforementioned cold-traps. For Io, the solar wind can't reach its surface due to Jupiter's strong magnetic field. So where does its water come from? 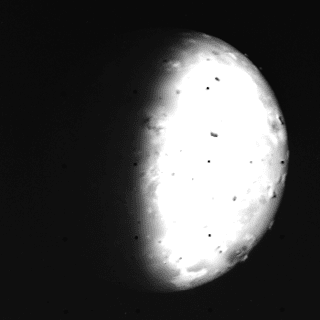 Again, oblique cometary impacts could be a source of water for Io. The two recent cometary impacts on Jupiter in 1994 and again this year would suggest that Io could be hit by water-rich cometary bodies on a regular basis. This could certainly be the source for the concentration found near Gish Bar Patera. For the global ubiquitous concentrations of water or hydroxyl ions, another mechanism maybe necessary. For example, low concentrations of water might be present in Io's magma, like here on Earth. Water vapor would then be released during volcanic eruptions and water ice would be deposited on the surface, however, no water vapor has ever been observed within Io's plumes. 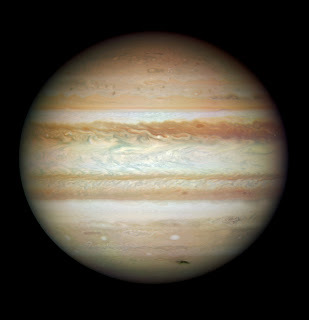 Another possibility could be that hydrogen ions from Jupiter's magnetic field break off oxygen from sulfur dioxide and silicate compounds on the surface then combine with them to form OH- or water, akin to the preferred scenario for the Moon. This discovery of OH molecules on the Moon is certainly interesting, and just goes to show everyone that water is quite common place in the solar system, even in the driest of places. Graphic above by University of Maryland/F. Merlin/McREL. The last talk in the Satellite Atmospheres session this past Thursday, September 17, was titled, "First detection of Io's atmosphere at 4.0 micron" and was presented by Emmanuel Lellouch et al. 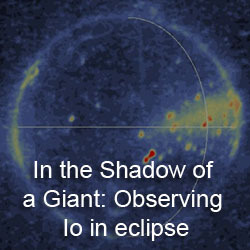 Lellouch and his colleagues observed Io in the near-infrared using the CRIRES spectrometer at the Very Large Telescope in Chile in July 2008. These measurements allowed the authors to observe an absorption band of sulfur dioxide gas at 4.0 μm. With the adaptive optics system at VLT, they were also able to spatial resolve variations in the absorption band, looking for differences in atmospheric column density between the polar region and the equator. Lellouch et al. believe that these observation open up a new avenue for monitoring Io's dynamic atmosphere. The Satellite Surfaces and Interiors oral session this past Wednesday, September 16 hosted two Io talks. 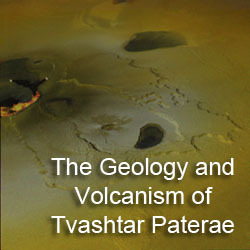 The first was titled, "Volcanism on Io: New Insights from Global Geologic Mapping" and was presented by David Williams et al. This talk and abstract provide an update to the Io geologic mapping project, a subject Williams presented at this year's Lunar and Planetary Sciences Conference, which I discussed in greater depth earlier this year. 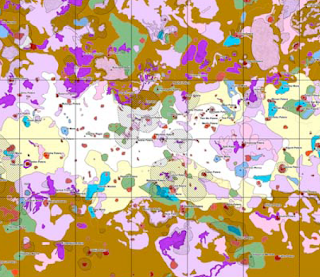 This geologic map displays the distribution of various morphologic and color units across Io's surface. Using software such as ArcGIS™ will allow researchers to use the map to conduct various lines of research, including comparing the areas of various mountain units with their heights, looking at the areal extent of the various plains units, and seeing how ongoing volcanism change these areal extent of the different lava flow units. The authors also plan to assess the distribution of different flow units to assess regional variations in the style of volcanism (sulfur versus silicate volcanism, for example) and compare these units to observed volcanic hotspots to look for correlations between eruption style and unit types. The Io Geologic map was completed in February 2009 and has been submitted to the USGS for peer review. A similar global geologic map of Ganymede was also presented at the conference, which has garnered some press coverage (but not Io's, bah I say, BAH!) . The other Io talk at the Surfaces session was titled, "Continued Observations of Io's Volcanic Activity" and was presented by Imke de Pater et al. In this abstract, de Pater briefly presents new results from observations of Io in the near-infrared using the adaptive optics system at Keck in Hawaii. These results include new observations of volcanic hot spots on Io as well as the distribution of sulfur dioxide frost across Io's surface. 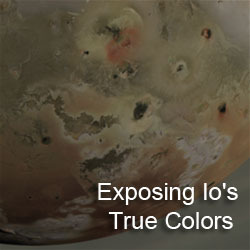 While the abstract left out specifics, the authors spent more time advocating for additional telescopic observations of Io. Regular observation runs were conducted during the Galileo mission and the New Horizons flyby in 2007, but outside of that flyby, Io monitoring has been sparse the last few years. 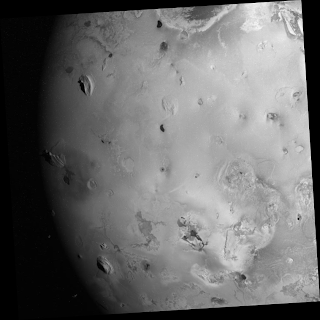 Regular monitoring is important for understanding Io's heat flow and its active volcanism. de Pater et al. 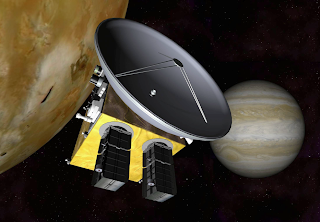 also advocate for the inclusion of narrow angle cameras on board Jupiter-bound missions, particularly EJSM, to provide for monitoring of Io and other satellites in the system. Finally, Ashley Davies, Laszlo Keszthelyi, and Alfred McEwen presented a poster titled, "Determining Io Lava Eruption Temperature: Strategies for a New Mission to the Solar System's Most Dynamic Satellite." These authors presented a similar poster at LPSC earlier this year, which was discussed here a bit more extensively. This abstract discusses how the desire to measure the temperature of Ionian lava using near-infrared camera observations of lava fountains and skylights (holes in the roofs of lava tubes). The authors explain that near-simultaneous, high-resolution color imaging during Io flybys by either a dedicated Io mission (such as the Io Volcano Observer) or by another Jupiter system mission (like EJSM) would be necessary for determining these lava temperatures without the issues from short-term variability (on the order of a few seconds) of lava fountains. The authors also state that these observations would need to be preformed over Io's night-side to avoid contamination from sunlight. With EPSC now passed and DPS abstracts online for that meeting in two weeks, we now have to wait for AGU abstract to be posted online. The Fall AGU meeting is scheduled for December 14-18 and abstracts for this meeting are usually posted online in mid- to late-October. At last year's fall meeting, five Io-related talks and posters were presented, so we will see what this year brings. This week's Carnival of Space, the 121st of its name, has been posted over at the blog Next Big Future. Check it out to read the best posts this week in the space blogosphere. Read about new results concerning Jupiter's aurorae, from the Lunar Reconnaissance Orbiter, and a treatise on spotting the International Space Station. Speaking of the latest in the space blogosphere, I direct your attention to one new blog and another reactivated blog. The former is Dr. Schenk's 3D House of Satellites, where new stereo images and movies will be posted based on data from Voyager, Galileo, and Cassini. His last few posts include movies showing the topography of Conamara Chaos on Europa, the Uranian moon Miranda, and the south polar region of Enceladus using images acquired during two encounters last year. Schenk promises to add stereo views of the Callanish impact crater on Europa as well as some views of Io, though that will take a longer to prepare due to Io's funky phase functions and surface changes. The latter blog is Ted Stryk's Planetary Images from Then and Now. Stryk posts reprocessed versions of spacecraft images, including those from early Mars missions, Voyager, and Galileo. One such image revealed one of Neptune's small, inner satellites, Despina, transiting its parent planet and casting a shadow on its atmosphere.